Shopping for a new stone benchtop for your kitchen? There are a lot of stone options in the Australian market these days, which is great! But it all drives down to two options. Man-made (aka reconstituted or reengineered stone) Quartz V Natural Stone. Are you looking for indoor or outdoor application? Do you need a stone benchtop to withstand a hectic lifestyle? Are you wondering which will add more value to your home? Have a read of this super informative article from Phillymag.com & Colonial Marble & Granite for a quick crash course in the differences and similarities between Quartz V Natural Stone. When you’re opting to swap out your old bar or kitchen countertops for something new, there’s a lot to consider. 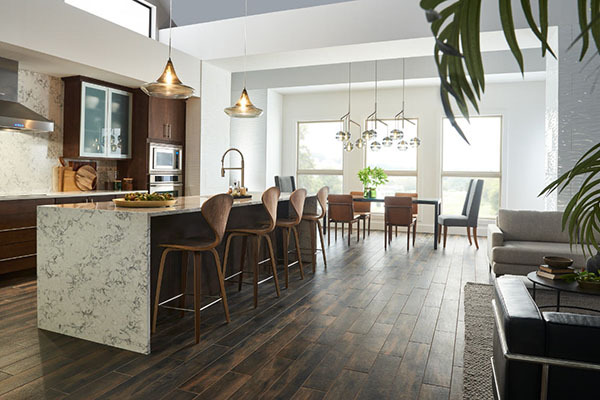 First, you need to think about value and quality — are you willing to pay a little extra for quartz or natural stone, which has more staying power than laminates and can also help raise your property value? 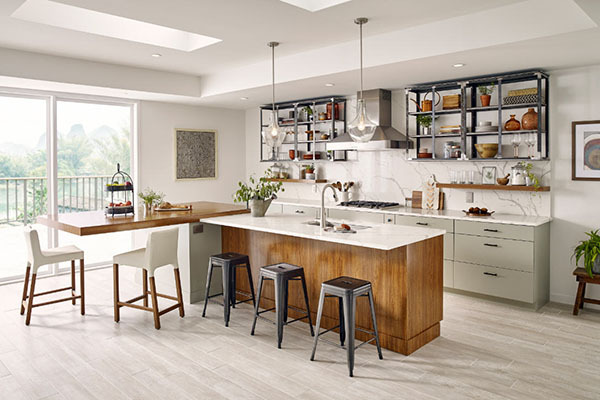 Aside from being a good investment for your home, natural stone or quartz are durable enough to withstand the wear-and-tear of extreme cooking and regular family gatherings. So, if you’re ready to make a valuable upgrade to your living space, here’s what you need to know about quartz and natural stone countertops, and what you should expect out of your install. Quartz, in its natural state, is found in large crystals or small, sand-like grains. Once mined, the stone is mixed with man-made materials, like resin, which allows for a cleaner cut and more scratch and stain resistance. Quartz is one of the most popular materials for counters and backsplashes, due to its durability and antimicrobial, non-absorbent properties. Colonial Marble offers one of the widest varieties of quartz in the country, from the extremely durable Q Quartz to ECO, which is made mostly of recycled materials and comes in a variety of hues and textured patterns. Natural stone is a bit less malleable than quartz but withholds a snowflake-like individuality that makes it truly, naturally unique. 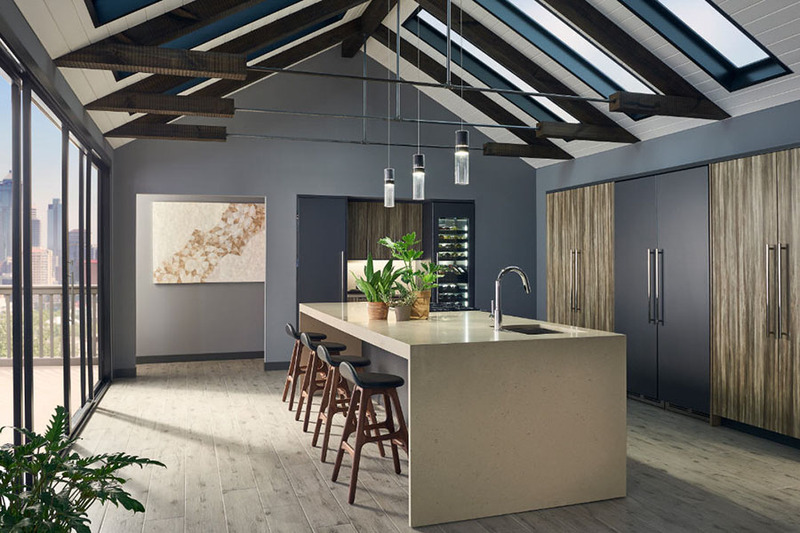 Sourced straight from the earth, natural stones like a soft-coloured limestone or bold marble show off raw patterns, flecks and textures that quartz can only mimic through manmade mixing. When it comes to choosing a timeless, on-trend look, Arctic Cream granite, Bianco Venatino marble and Lagos Blue limestone are three (literally) solid options. Quartz is fused with resin and other polymers, and does not need to be sealed regularly. Natural stone, however, may require yearly sealings to maintain its smooth look and durability. Additionally, this material makeup is less prone to chipping than natural stone. Since quartz is mechanically engineered with naturally mined materials and binding resins, cleaner cuts are available. It’s because of this that quartz is considered extremely design-friendly. When opting for natural stone, it’s a good idea to go with an “eased edge,”. It gives the stone a thick cut look that helps to play up the natural texture and marbling. Quartz and natural stone are both extremely heavy. Due to this, it is important to work with a professional during installation. The team at Colonial Marble will not only help with installation but can provide samples, quotes and even a Kitchen Visualizer to help you decide just where to make your upgrades. Natural stone and quartz do not always hold up to extreme weather conditions, making indoor installation the preferred method. Planning on installing an outdoor bar or fireplace? Make sure your granite or marble surface is safe from hard rain and the scorching sun. Historically, the price of quartz and natural stone, like marble, seemed out of reach for many. But, as granite, marble, quartz and stone countertops become increasingly trendy in today’s homes, materials are becoming more and more affordable. Curious Over A Quartzite Benchtop Granite Benchtops – Hard To Beat!